Odds-on favourite So Mi Dar ran out a convincing winner of the Musidora Stakes at York as jockey Frankie Dettori clocked up a treble. The daughter of Dubawi, trained by John Gosden for owner Lord Lloyd Webber, won by four lengths from Fireglow. Dettori was able to give his mount a celebratory pat before passing the winning line. Bookmakers rate So Di Mar the 5-2 second favourite behind Minding (5-4) for the Oaks at Epsom on 3 June. Victory brought up a double for Dettori, who also won the Duke of York Stakes on Magical Memory, trained by Charlie Hills. He completed a treble from three rides when Gosden's Castle Harbour later landed the Conundrum HR Consulting Stakes. It was a third career triumph for unbeaten Epsom Derby Trial winner So Mi Dar, whose dam Dar Re Mi won three Group One races. "She'll give me a good spin around Epsom," said Dettori. "She's got what you require (for the Oaks) - she's got tactical speed, she travels, quickens and stays the distance." "Intriguingly both So Mi Dar and Minding have beaten Fireglow impressively by about the same distance though this race was over a quarter-mile further than the Guineas. 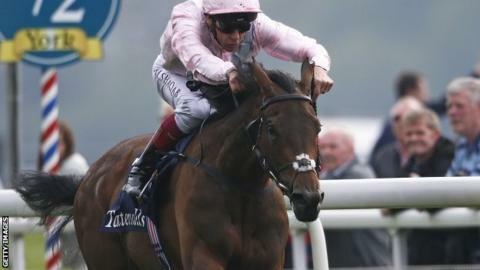 What a potentially thrilling clash at Epsom theirs could be."